Grow a business that blogs and you will undoubtedly grow your income too. Blogging is a way to promote what your business has to offer. You won’t earn income if you refuse to get out of your comfort zone and hide behind the laptop. Whether your business is selling a product or you are providing clients a service; adding additional income is always welcome. 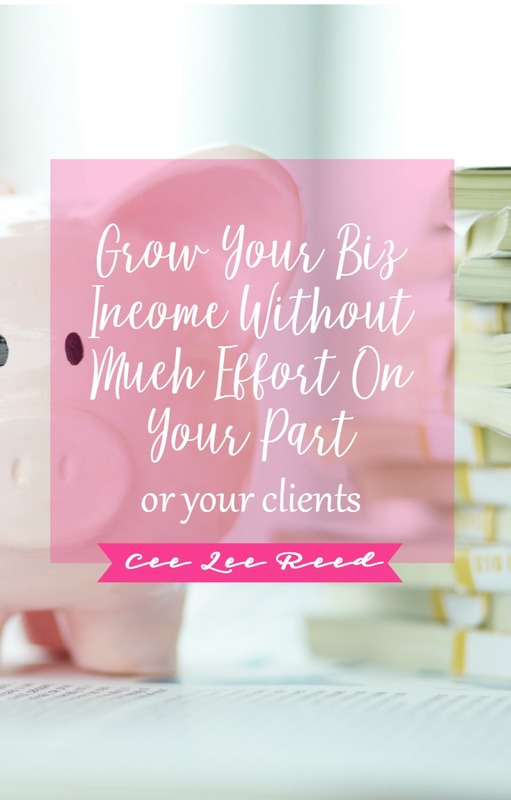 Here are several awesome ways to grow your biz income with + without much effort. You’ve already got a business that blogs so instead of reinventing the wheel, why not just “rethink” the ways you are currently marketing your goods and services. Most of the time, we can tweak our current packages just enough to produce a second (or sixth) income stream. Yes, I know you love your clients. Yes, I know it’s scary to change prices. Do it anyway. NOW. You know darn well that you are worth every penny and so is that 6 week course you spent month’s creating. Log into your website’s dashboard and update that package price by 20%. Feels too ballsy? Fine, 10%…but not a point lower. You can grow your biz income with the very next client by just raising your rates a little. Still nervous? Go ask all those people that gave you testimonials if they’d pay the higher price. Oh, they said YES!!! There you go. Don’t give it another thought until the new year when you should raise them again. Here’s how Marie Forleo does it. Instant payday: 1 coaching client per month at $2000 raise price 20% and get a $5K increase. One of the easiest ways to grow your biz income is to create a new service package or product. A perfect example of doing this with very little effort is by turning your coaching package into a group coaching experience. You have already created the flow of your current program so all you are doing is offering it to the masses. You save time by teaching in a group setting and you can automatically grow your biz income by charging a bit more to the group. Like with the scenario above, let’s say your 1-on-1 coaching is $2000. Now you’re charging $297 per group participant and you accept 10 people. That’s almost a $1K raise. Probably the easiest way to grow your biz income without much effort is to upsell every customer and client. Think about it. If your customer loves your goodies enough to buy the first time, they’ll be thrilled to get more offers from you. You’ve done the hard work of getting a client, now share all of your services with them so they have their pick of the services they need. Upsell each client with a $27 workbook that will make their journey with you easier. BOOM, extra income. If they’ve bought every course you sell, then move them toward coaching. They need it. You know it. Share it. A few small changes in your business that blogs will grow your biz income immensely. Don’t be afraid of change. It always works out. Facebook Live is all the rage right now so use it as a tool to harvest clients. Put your expertise out there for potential clients to see. It’s so much easier to get an idea about the personality and work ethic of someone when you can watch and listen to them on video. Use that to your advantage. Would you rather read about your coach or have them tell you their story personally? You can promote your business on video every single day. If you are a coach, then offer expertise on what you do best. If you sell a product, demonstrate it in a 3 minute video. All of these things will get the attention of your fans and then you just need to seal the deal by highlighting your amazing skill set. Once you get good (and you will get better), you can use those videos everywhere. Get over your fear of video training when you work with me this month; we focus on conquering that hurdle. Eventually, you’ll notice your website pageviews growing and the amount of discovery calls increasing. Close clients on those calls and this will lead to more income in your pocket! Advertising on your blog’s sidebar is a great (and almost passive way) to grow your biz income with little effort. You can sign up for ad networks that will promote their products and services to your readers. When your readers are interested in the product being shown, they’ll click on the ad and you’ve just made money. Feels good doesn’t it? Be sure to review the terms and ads to ensure they are relevant to your blog topics. Just like during charity events, your blog and social media channels can have sponsors. Companies love to hire businesses that blog to talk about their products. When you promote them to your readers, they pay you a pre-negotiated rate (demand payment upfront). Sponsors are available everywhere and it’s pretty normal to have them pay you to write blog posts. A good minimum starting rate is $125/post. Create one of them each month and you have yet another way to grow your biz income doing what you already do each day. Podcasters often have sponsors for their shows so don’t be afraid to reach out to a brand that would be a perfect fit for you to talk about. PRO TIP: The secret to earning a lot of dough with advertising is to increase your blog’s traffic. More traffic means more clicks! Affiliate revenue is a very popular way to grow your biz income. You can sign up to be an affiliate for another business or blogger and help sell their products or services. Be sure that you truly believe in the person you are promoting though or you risk damaging your own reputation. Your readers and clients come to you out of mutual trust so never promote something just for the money aspect. Jump on board if the product you’re promoting is something that you would suggest to your clients regardless of the additional income you’re making. You know you have a great affiliate relationship when you can grow your biz income and help your clients at the same time. The same thing works in reverse. Built an amazing business system? Create an affiliate program and have others promote you. Benefit from their marketing efforts with additional sales that you pay them pennies on the dollar to garner. Genius really. 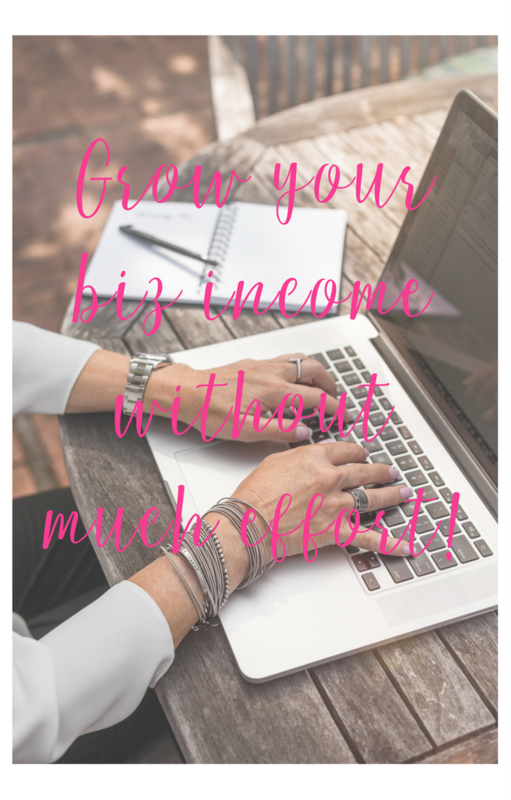 Spend some time this week thinking of all the ways you can grow your biz income by adding some new products and services to your current line or by embellishing those you already market. Your clients will be thrilled with the updated information and multitude of options you offer. The best way to grow your biz income is by increasing the amount of income streams that your business offers. Give your peeps a way to support you and they will. PS: Grow your biz income by calculating how many clients you need to cater to.